What if you could work at a radio station for five days? An internship at Radio Foorti for a week seemed to me a taste of a dream job. 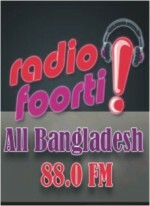 Radio Foorti is possibly the most popular Bangladeshi radio station in Dhaka today. It's a kind of radio station that wants you to break out of the mundane cycle that everyone follows and have fun in your own way. Their target audience are mainly teenagers (the youth) and people who are young at heart. On my first day, I arrived there at 10:00am. My working hours were from 10:00 to 3:00. I didn't see my boss for a while but then one of the RJ's came over and told me I would be working with her. We started out with a tour of Radio Foorti. I met a lot of wonderful people including the other RJ's. I also got to meet my boss an hour later. He is the coolest boss I've ever had. I got to know about the departments, the studios and something called CSR. CSR or Corporate Social Responsibility involves companies that make profits by giving back to the society through various projects. Radio Foorti has three different departments. The Programmes Department, which mainly deals with all the shows and music schedules, the Sales Department which handles all the advertisements that go on air and lastly, the Finance/Accounts Department that works with the sales. Later, things started to get more interesting. I finally made it to the studio where all the “On Air” shows are held. I was lucky enough to watch and observe a live show called 'Hello Dhaka', which went on from 7:30am - 11:00am, hosted by the famous RJ in Dhaka, Sadia. In the room, I noticed that they had three computers. The first computer is the one that controls the scheduled songs and time, the second one runs the background music and databases and the third computer which manages all the messages they receive from their listeners. There is also a Control Panel which is the main operator managed by the RJ. It was very exciting to be in that room. It kind of made me feel like I was backstage at a concert. I thought my first day would be scary, as I am the nervous type when it comes to meeting new people and going to new places but it turned out to be the exact opposite. I enjoyed the experience instead. I had lunch with several people at Radio Foorti and headed home around 3:00 pm. I was ecstatic about my second day as I had a great time during the first day. I reached Radio Foorti at 10:00am and got my very first assignment by RJ Sadia which was to search and pick interesting/weird topics that the RJ could talk about on his/her show. Sounds pretty boring right? Believe me, it wasn't. After I was done, I gave my project to RJ Sadia. She was so pleased; she actually picked one of the topics for her show. Day three, I got to learn more about Radio Foorti and their different shows. Radio Foorti starts off with a morning show called 'Hello Dhaka!” carried out by RJ Sadia as I've mentioned before. Following that, there is another show that starts at 11:00 and goes on till 1:00 hosted by RJ Mukul, called the 'Tea Stall', one of my favourite shows. The next show that takes place is called 'No Tension' which is done by RJ Nusrat and goes on from 1:00 to 4:00. 'Dhaka Calling' is the closing show, that starts at 4:00 and finishes at 8:00, operated by RJ Apu called “Dhaka Calling.” These shows take place on the weekdays from Sunday to Thursday. On the weekends, (Friday and Saturday), there's 'Addabaaji' from 8:00pm-10:00pm, by RJ Russel. He also has another show from 11:59pm - 2:00am called 'Bhoot FM' where he talks about various ghost stories. 'Foorti Rewind' which is hosted by a guest RJ goes on from 10:00 to 12:00 and lastly 'Friday Fantastic' is hosted by RJ Aasna, going on from 6:00pm to 10:00pm. Radio Foorti doesn't have any late night shows but there are more shows in the pipeline. There has also been an exciting RJ Hunt for new and fresh RJs! Day five was my last and also the best. We all went out for lunch and my boss told us hilarious stories about his childhood and his friends, we had good food and I spent a great time with my 'colleagues'. I was feeling a little blue because I didn't want to leave. I had such a great time with them that I felt like I belonged. They made me feel like I was a part of their team and I do look forward to doing something like this in the future. It was the third consecutive day. I was late for class again, and this time not for five or ten minutes, which has almost become part of our daily schedule - rather I was late by one full hour. I entered the class. My heart skipped a beat. “Traffic jam, isn't that the excuse? Next time onwards try to head off even earlier,” that was what sir said. I could not argue with him, but you all know that it was not an excuse, rather a reality. When is there no jam on the principal roads of Dhaka city? From as early as 7 a.m. to as late as 11 p.m., this curse - 'Traffic Jam' is making our lives a nightmare. Have you ever thought about how many hours an average man spends on the road, instead of working? Is not this reducing our productivity as a nation? Work that can be done in 20 minutes needs at least an hour to be done. Toddlers fall asleep on their way to school as they have to leave for school as early as 6:30 a.m. to catch classes at 8 a.m. They have inadequate sleep which hinders their natural physical and mental growth. Elderly people who are close to their retirement age, instead of enjoying their last days at work, dread to get out every morning. Even once they reach their workplace, they constantly worry about the fact that they would have to return the same way. This problem is not natural, it is man-made. Instead of just criticising the authorities, we should think about what we should and can do. Yes, the initiatives by authorities are inadequate, but can't we make a change from our own levels? Everyone can contribute from their own places. Do we follow traffic rules? It's simple - red means stop and green means go. Even kids know this. But once they grow up they forget it when they repeatedly see that traffic police, ignoring the traffic lights engineer the system and manage it manually. Don't you have a temptation to go ahead whatever the rules are? We can try to control this temptation and also tell our drivers to do so. Can't we stop parking cars on the roadside where it is illicit? Why do the police have to force us? Can't businessmen and traders be sensible enough not to block footpaths and pavements illegitimately? Can't builders restrain themselves occupying roads with their building materials? Can't we all encourage rickshaw pullers not to block roads instead of just yelling at them? When two people from the same locality have a common destination, can't they share cars? 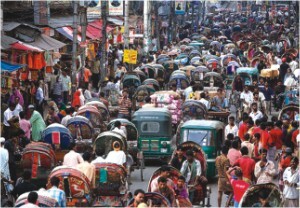 Traffic jams are one of many problems of Dhaka city, quick elimination is not achievable, but reduction is surely possible. Humans are esteemed as the best creatures on Earth. So can't we try to play our individual roles in reducing this relatively simple man-made problem? 13/10/2010 - an angel arrives in our lives. 5/11/2010 - an angel flies to the heavens leaving my heart shattered into a million irreplaceable pieces. He has left us, but the memories inside my head still linger. Now I understand what death is. When someone dear to you dies, you feel like part of your heart died too - the part that now lies in the heavens. I try to forget the memories, but everything surrounding me reminds me of the only creature I loved so much in my entire life - our puppy, Odie. Odie's bowl, his puppy brown eyes, his memories inside my head, when he licked me, caressed me and when he passed away in front of me; I want to forget them, all. My brother and me, we prayed to Allah to give us some more time so that we could get him healthy again. That didn't happen and Odie knew it wouldn't and so did a little voice inside me. But I couldn't believe it. He was too precious to go away just yet. I still hoped that while he was wrapped inside the back of our car that afternoon, he would come back to life in some supernatural way and he would jump into my lap. But he was buried. I couldn't stop the tears flowing across my cheeks. I loved him so much I couldn't accept the fact that he was gone. Expired. Out of this world. Away from me. I wondered if he knew how immensely I loved him. He couldn't see how much I cried for him; how much I wanted him to stay. I asked Allah to give me a sign that he is better off up there; that he loves us too and that he misses us. Some might not understand why I am so devastated at the death of just a puppy, but no one knows how much I adored him. If anyone got a chance to peek inside my head maybe they would understand. Every event in life has a lesson behind it as well. I learnt from Odie's death to live in the moment and to cherish what I had. Not grieve over what I lost or don't have. Sure, would I give up everything I have to get him back? Of course. But for now, I've learnt to let him go. Not from my heart but at least accept that he has passed away.